THE SWISS ENTRANCE to the Simplon Tunnel, which links Switzerland and Italy. The tunnel is about 12¼ miles long, and was begun in 1898. Two parallel tunnels, about 56 feet apart, were driven, only one immediately being enlarged to full size, 13 ft 7-in wide at floor level and 18 feet high. The second tunnel was enlarged by 1921. Electrically operated curtains close the entrances when trains have passed. THE four great Alpine tunnels - the Mont Cenis, St. Gotthard, Simplon and Lötschberg - form a group which, for length and interest, is unrivalled anywhere. Driven through the solid fabric of mountains whose summits are crowned with everlasting snow, they run thousands of feet underneath passes whose steep, tortuous slopes had been painfully trodden, ever since the early centuries of European civilization, by pilgrims, merchants and armies. With the mountains they pierce rising thousands of feet above the tunnel entrances, it seems almost incredible that there were men bold enough to conceive such projects, or patient and hardy enough to execute them. The Mont Cenis Tunnel is 8 miles 832 yards long and forms part of the direct rail route between Paris and Brindisi. The tunnel runs between French and Italian territory under the Col de Fréjus, the pass over which a military road was built, at Napoleon’s order, by the engineer Fabbroni in 1802-10. The road cost £300,000, and the tunnel almost exactly ten times as much. Mont Cenis, after which the tunnel is named, lies about fifteen miles north-east of the Col de Fréjus. The tunnel runs from a point near Modane, in French Savoy, to one not far from Bardonnéche, in Piedmont. It was driven through solid rock throughout, and was necessarily drilled from the two ends only, the great height of rock above the axis of the tunnel making impracticable the use of vertical shafts and intermediate headings. The level of the Mont Cenis Tunnel at the French entrance is 3,801 feet, and at the southern or Italian entrance 4,236 feet above sea level, or 435 feet higher than the other entrance. To facilitate drainage, the tunnel was formed with a rising gradient from either end. The summit, at the centre of the tunnel’s length, is 4,284 feet above sea level. As the Italian entrance is considerably higher than the French, the gradients differ widely. The average rise from Modane to the summit of the tunnel is 1 in 45½, and the descent from there to Bardonnéche is much less steep. The originator of the Mont Cenis Tunnel was neither an engineer nor a scientist, but a Piedmontese peasant - one Giuseppe Medail, a native of Bardonnéche. In 1838 he submitted to King Carlo Alberto of Savoy a scheme for piercing a tunnel between France and Piedmont on the exact line, Modane to Bardonnéche, which was afterwards adopted. He based his scheme on the facts, which he had largely established by his own observations, that the difference of level, and the length of tunnelling required, would be less in this position than in any other for many miles round. His plan was received sympathetically, but with no marked enthusiasm. In 1845, however, the Piedmontese Government detailed Mauss, a well-known Dutch engineer, to examine the proposal with Sismonda, an Italian geologist. They temporized, laying stress on the unprecedented character of the undertaking and on the practical difficulties involved, chief among these being the enormous length of time which the tunnel would take to complete if all the blast-holes were to be drilled by hand. The only alternative process yet adopted in such work, the use of steam drills, was out of the question in so long a tunnel, necessarily devoid of intermediate ventilating shafts. This particular stumbling block, however, was removed by a suggestion put forward by the physicist Colladon, of Geneva - now best remembered by his determination, conjointly with Sturm, of the velocity of sound in water. Colladon recommended the development of a suitable type of compressed-air drill, supplied from external compressors operated by the abundant water power available at both the proposed entrances. Not only would such drills speed up the rate of tunnelling to a reasonable amount, but the exhaust air discharged from them would go a long way towards solving the problem of ventilating the tunnel before the headings met. This plan, requiring a type of compressed-air drill evolved by the Italian engineer Sommeiller, and first brought into service in 1861, proved ultimately to be the secret of success. For the first three years of the work, however, hand drilling alone was used. The first of innumerable “shots”, or blasts, was fired (at the Modane end) on August 18, 1857, and the French and Italian headings began to creep slowly through the miles of solid rock which divided them. The advanced heading, a narrow rectangular gallery, was carved out of the rock by blasting, the holes for the charges being drilled by hand. The charges used throughout the whole work were of gunpowder, made up in pasteboard cases and ignited by slow-match fuses - a remarkable contrast to the dynamite, electrically ignited, of modern engineering. The bottom of the advanced heading formed the floor level of the tunnel, the gallery being afterwards enlarged, at sides and top, to the required section, and lined (except for a short portion driven through abnormally hard rock) with masonry. This precaution, superfluous at first sight, was entirely necessary. But for the masonry, the arch and sides of the tunnel would not improbably have given way, at various points, under the huge weight of the mountain above them. In the later Simplon tunnel, where the summit of the pass is more than 7,000 feet above the tunnel-axis, it was found that at one or two points even the provision of masonry arches and sidewalls was insufficient. The floor of the tunnel was forced up by the pressure, and had to be held down by an invert, so that at such places the section of the tunnel was a complete tube of masonry. The final section of the Mont Cenis Tunnel varied slightly at different points, but averaged approximately 25 ft 3½-in across at floor level, 26 ft 2¾-in at the widest diameter, and 25 feet high. It was designed to carry two lines of rails. INTERNATIONAL RAILWAY COMMUNICATIONS have been improved by the piercing of the Alps in four places. The Mont Cenis Tunnel, between Modane and Bardonnéche, links France and Italy. The Simplon Tunnel, linking Brig, Switzerland, with Iselle, Italy, is on the route of the Simplon-Orient and other international expresses. This line is joined by another international route, carried in Swiss territory beneath the Bernese Alps through the Lötschberg Tunnel. The St. Gotthard Tunnel, also entirely in Switzerland, between Göschenen and Airolo, provides direct communication between the railways of Germany and Italy. During the period of hand-drilling, the progress made was slow. On the average, neither heading could be pushed forward much more than nine inches a day - and, by the most optimistic forecast, thirty years would have elapsed before they met. But Sommeiller’s prolonged effort to develop a satisfactory form of compressed-air drill came to a successful conclusion by the end of 1860, and the Italian heading was equipped with the new machines for the first time in January 1861. They were an immediate success - but, because of the time required for producing them in sufficient quantity, the French heading continued to use hand-drilling for another year, until January 1862. The compressed-air drills considerably increased the rate of progress. But there was still much to be learned about the best size of drill and the speed at which it should operate. Sommeiller’s drills were of the percussion type. They did not advance by pure rotation, but bit their way into the rock by a series of sudden, violent blows given in rapid succession, the resulting debris being washed out of the borehole by water under pressure. At first a set of four drills, gradually diminishing in size as the bore deepened, was used for each hole. This method produced a tapered hole, slightly larger at the outer end, which was not well adapted for blasting, as firing a series of such holes generally left a number of cones of hard rock sticking out of the working face of the heading. Attempts to get over this by drilling the holes so close that their sides met were unsuccessful. The drills ran off centre, pierced the side of the adjoining hole, and stuck. Sommeiller, therefore, ultimately evolved a form of two-step drill which had many advantages. The leading portion of the drill cut a smooth-sided 2-in hole, which acted as a guide for the following 6-in portion. One of these new tools could drill a 6-in hole 3 feet deep in an hour, and could cut three such holes in succession without sensibly blunting its edges. Previously it had been no uncommon thing to use as many as six drills to cut a single hole 3 feet deep and only 4-in in diameter. The most crucial part of the whole work was the orientation of the two headings. For these to meet it was necessary to ensure that their maximum deviation, either horizontally or vertically, from the exact line assigned to them should not exceed at their point of junction the cross-section of the tunnel - a permissible error for either heading of only some 13 feet in 3·8 miles, corres-ponding to an angle of no more than 0° 2¼’, or 1/2400 of a right angle. It was therefore imperatively necessary, in the first place, for the engineers to connect their observing stations, at either end of the tunnel, by triangulation - and here the configuration of the Col de Fréjus came to their help. From a central observatory located at its highest point, the Modane and the Bardonnéche workings were in view simultaneously. It was therefore a comparatively simple matter to lay down and verify as often as required the relative positions of two pairs of fixed marks, established at either end. Each pair constituted a fixed line of direction, with which the axis of the respective heading was made to conform, as it advanced, both vertically and horizontally. So well were the leading marks alined in the vertical plane that when the headings met no error in direction was perceptible; the error in elevation, which the use of a central observing station could not entirely eliminate, was much less than the permissible amount. Once the initial difficulties with the machine drills had been successfully overcome, the routine of the slow, methodical advance varied little. The cross-section of the advanced gallery - the spearhead of the attack - was ultimately standardized at 9½ feet by 8½ feet high. A battery of drills, mounted on a rail-truck, would attack the rock face over an area of this size, drilling a series of eighty holes. These were grouped centrally, at the top and sides of the heading, midway between the centre and the bottom, and at the foot. The first three groups were then loaded with their powder charges, and the drill carriage and its tender were backed out of the danger zone and protected by temporary barricades. The holes were then fired and the debris, overlying and blocking the holes at the foot, was cleared with pick and shovel and loaded into horse-drawn tips for transport to the entrance. The holes of the last group were then loaded and fired, and the broken rock cleared out as before. WORK AT THE ENTRANCE to the St. Gotthard Tunnel, which was begun in the autumn of 1872. Its length is about 9¼ miles. Compressed air was used to operate the drills throughout. The headings were enlarged originally to only half the full designed section of the tunnel. During the period of hand-drilling, and for the first year of machine-drilling, no special ventilation was provided for the two shafts. With hand-drilling, the rate of advance had been so slow, and the headings so short, that the lack of ventilation was not seriously felt. With the machine drills, too, the exhaust air they discharged had proved, so far, quite adequate to keep the atmosphere of the workings respirable. Each drill used 8 cubic feet of compressed air a minute. On exhausting, this became 48 cubic feet of fresh air at normal pressure and, during expansion, it considerably reduced the temperature of the working. With an average of eight drills constantly at work, this meant a steady supply of 384 cubic feet a minute. Although this supply of air would probably have proved sufficient for the workers in the advanced galleries until these met, it was not adequate in the enlarged sections of the tunnel lying farther back. Here the air was stagnant, humid and foul. By the summer of 1863 it had several times been found necessary, in emergency, to open up the air-service pipes, at intermediate points, to give relief to the workers there. Further, the introduction of coal-gas, piped from outside as far as the working face, as an illuminant, made the need for a ventilating system fell the more urgent. So, in 1864, each shaft was divided horizontally along its whole length by a light temporary wooden brattice, slightly arched. This brattice was composed of planks covered and made airtight by a 3-in layer of well-beaten earth. The foul air was drawn out along the upper half of the shaft and fresh air entered, to take its place, along the lower. 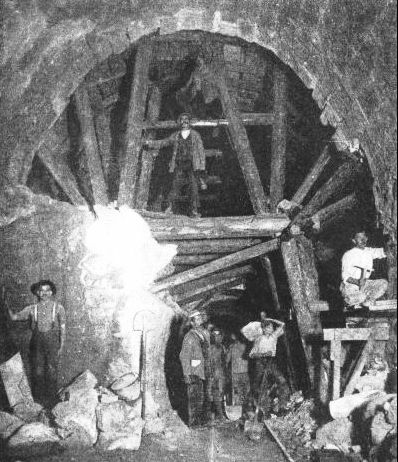 At the Italian end of the tunnel, where the gradient was slight, the foul air was at first exhausted without much difficulty by connecting its outlet to a chimney rising about 300 feet above tunnel level. As the shaft gradually lengthened this method proved insufficient, and the installation of a furnace in the chimney still failed to give enough draught. Ultimately, induced draught was provided by a single large fan (32 feet in diameter) and no further trouble was experienced. On the French side, where the gradient opposing the indraught was steep, the engineers soon found that neither chimney nor fan would give adequate ventilation, and powerful exhaust pumps were installed. During the last two years of drilling, however, the problem of ventilation once more became acute, for two reasons - the great distance between working face and entrance, and the greatly increased number of workers in the tunnel. This increase was made necessary by the ever-increasing rate at which the advanced galleries were being pushed forward. Although varying considerably with the different strata encountered, this progress averaged, through-out, five times the rate accomplished with the original hand-drilling methods. During the last year before the headings met progress sometimes amounted to nearly seven feet a day. Ventilation remained much of a problem even after the tunnel had been completed and formally opened. Not for the first time, it was found that theory would not square with practice. It had been expected that, since the Italian end of the long boring was 435 feet higher than the French, a continuous, steady draught of air would be drawn through the great tube at all times, and in all states of weather. But this was far from being realized. The natural draught through the tunnel varied from a gale down to complete stagnation - at which times the trains moved, from end to end, through a stiflingly hot bank of thick, sooty smoke. Apparently, quite a light southerly wind blowing into the Italian entrance was sufficient to nullify the natural draught altogether - and a slightly stronger wind would reverse it. Therefore the tunnel was permanently fitted with compressed-air ventilation supplied by pipe line. TIMBER SUPPORTS were used temporarily to strengthen the Simplon Tunnel as it was driven. With 7,000 feet of rock above it was decided to drive separate tunnels for each track. At one point a large subterranean spring was struck. For thirteen years, from 1857 to 1870, the two head-ings crept towards each other with gradually accel-erating pace. Throughout this period, every care was taken to detect, and immediately correct, the most minute deviation of the shafts from the axis established by the fixed marks at either entrance. Even so, when the headings converged in the last weeks of 1870 the engineers had their full share of anxieties and apprehensions. The margin for error was small and they were working more or less in the dark, with no previous experience to guide them. A microscopically wrong placing of one of the leading-marks would mean that one heading would pass to right or left of the other - which would entail groping for a junction by driving exploratory headings, while the completed tunnel would have at least two angles in it. For a few days at the end of 1870 it seemed likely that their worst fears had been realized. The two headings were obviously close, as the men in each heading could hear work going on in the other; and, by measurement along the shafts, it was established that the total length of the two was several feet more than the theoretical length of the tunnel, as determined by the triangulation. Apparently the headings had overlapped; but it was decided to continue tunnelling until either the headings met or the length of the apparent overlap put its existence beyond dispute. On Christmas Day, 1870, at 4.25 pm, a drill on the Italian side, having cut an exploratory borehole 12½ feet long, went through into the French heading, having pierced the curtain of rock dividing the two. Next day, this curtain was demolished by blasting, and the two galleries met. It was found that there had been no perceptible error in direction and only a slight error in elevation, the floor of the French heading being about a foot above that of the Italian. 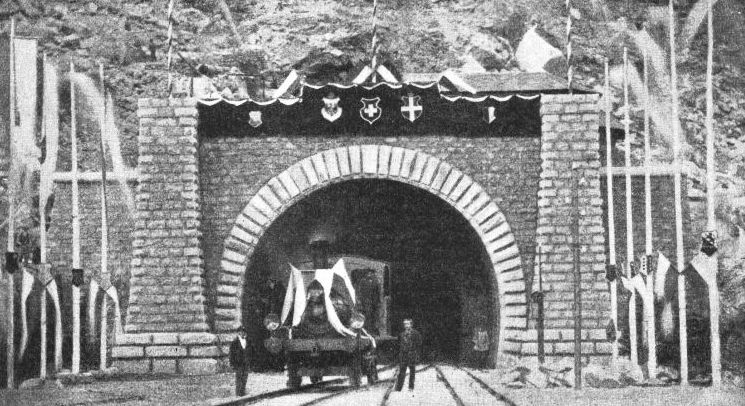 The Mont Cenis Tunnel was formally declared complete and open for traffic on September 17, 1871. Its successful completion revived interest in a scheme, first discussed in 1840-50, for driving a tunnel under the famous St. Gotthard Pass. 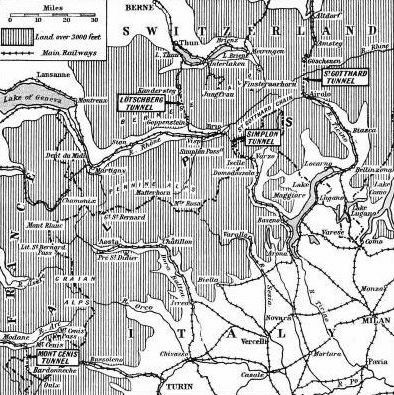 Although lying entirely within Swiss territory, such a tunnel would be of international benefit as providing a direct rail route between Germany and Italy. In 1871 a tripartite treaty was signed, providing for the building of the tunnel and specifying the proportions of its estimated cost to be defrayed by Switzerland, Germany and Italy. The contract for building it was allotted to M. Louis Favre, of Geneva, who undertook to complete the work within eight years. The specified cross-section of the tunnel was almost identical with that of the Mont Cenis Tunnel and its completed length was 9 miles 551 yards. The summit level of the St. Gotthard Tunnel, roughly midway between Göschenen and Airolo, is 3,786 feet above sea level. It is approached up a gradient of 1 in 172 from Göschenen, and of 1 in 1,000 from Airolo. Work began in the autumn of 1872 - on September 13 at Airolo, and on October 24 at Göschenen. Full advantage was taken of the experience gained at Mont Cenis. Compressed-air drills of the Sommeiller pattern (afterwards superseded by improved forms) were used from the start. The advanced headings, instead of being flush with the floor level, as at Mont Cenis, were run in level with the roof of the finished section, this plan offering various advantages for drainage and ventilation. The advanced head-ings were enlarged at first only to half the full section of the tunnel, allowing space for a single line of rail. Several years after having been opened for traffic, however, the tunnel was enlarged to its full designed section. In alining the axes of the two shafts of the St. Gotthard Tunnel the plan of a central observing station, used at Mont Cenis, was impracticable, as the Kastelhorn, the highest point of the pass, had two summits of almost equal height (one of which was inaccessible) and both lying more or less on the line of the tunnel. The observing stations at the entrances had therefore to be connected by indirect triangulation. This work was performed in 1869 by a surveyor named Otto Guelpke, who used a chain of eleven triangles and a base line of 4,757½ feet, laid off on the Andermatt plain. As was shown when the headings met, this work was executed with great accuracy. THE ST. GOTTHARD RAILWAY climbs up steep gradients from Göschenen to the summit of the tunnel, 3,786 feet above sea level. Giant electric locomotives of 8,500 horse-power can haul trains of 600 tons up such gradients at a speed of 40 miles an hour. Throughout the whole course of the work ventilation was maintained by exhaust fans at the tunnel entrances capable of extracting 16,500 cubic feet of air a minute. So efficient did this system prove, that on no occasion did the temperature at the working faces exceed 75° Fahrenheit. As a precautionary measure, however, a vertical ventilating shaft was sunk at Andermatt, near the northern entrance of the tunnel. On February 28, 1880, the foreman at the southern working face, probing this from time to time with a 10-feet steel “jumper”, found it suddenly plunging into empty space, and through the 3½-in hole thus made communication was established with the northern workers. The intervening curtain of rock was cautiously demolished with reduced charges, and when its thickness had been brought down to 4½ feet a final blast (February 29, 1880) shattered it, leaving a funnel-shaped hole big enough for a man to crawl through. It was found that the errors of orientation, when the two headings met, were, no more than about 4-in vertically and 7-in horizontally. As in the Mont Cenis Tunnel, the measured length of the tunnel was slightly greater than the computed - in this instance about 25 feet greater. The first locomotive passed from end to end of the completed St. Gotthard Tunnel on December 23, 1881, and the Göschenen-Airolo line was provisionally opened for traffic on January 1, 1882. 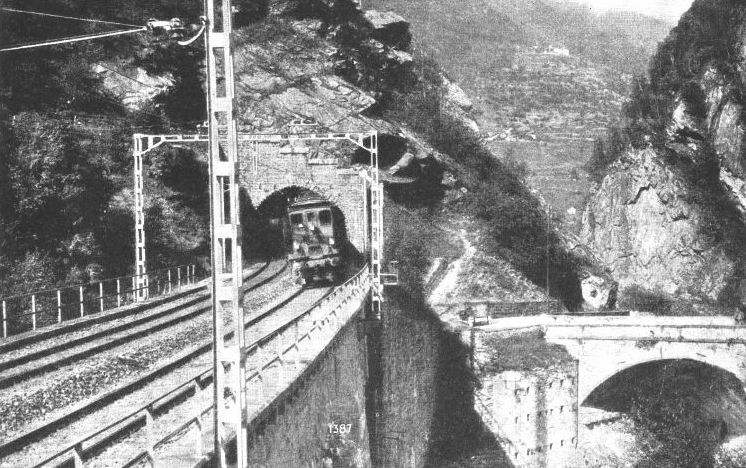 The Simplon Tunnel, the longest continuous railway tunnel in the world, was begun in 1898. It lies slightly north-east of the Simplon Pass, and runs from Brig (Switzerland) to Iselle (Italy). Its length is 12 miles 668 yards. The Simplon Tunnel marked a departure from the accepted form of Alpine tunnel used at Mont Cenis and St. Gotthard. Instead of a single tunnel of comparatively large section, accommodating two lines of rail, it consists of two smaller single-track tunnels running parallel about 56 feet apart throughout, and connected every 220 yards by cross-headings. It was considered by the engineers (and as the event showed, with good reason) that for a tunnel which, at its centre, would have 7,000 feet of solid rock above it, the large cross-section used in the two former great tunnels would be unsafe and liable to collapse. The tunnel was therefore built in duplicate - the expense of this being initially reduced, as far as possible, by leaving one of the tunnels no bigger, throughout, than the advanced heading, and using this as a ventilating shaft. The other was enlarged to its finished section - 13 ft 7-in at floor level, 16 ft 5-in maximum width and 18 feet high. The headings met with almost inappreciable error, and the working tunnel of the pair was completed and opened to traffic in 1905. In 1918 the work of enlarging the second tunnel to full section was put in hand, and it was completed in 1921. Last among the great Alpine tunnels comes the Lötschberg, begun in October 1906. It is entirely in Swiss territory, piercing the Bernese Alps between Kandersteg and Goppenstein. The Lötschberg Railway joins the Simplon line near Brig. The tunnel has two tracks and is just over nine miles long. Unlike the tunnels already described, it is not straight, but forms a widely obtuse angle - a silent memorial of a catastrophe unique in the annals of rock tunnelling. It was originally designed to be straight, and 8½ miles long only. Its line passed under a gorge which, ever since the Ice Age, had been half-filled with accumulated detritus, over which the Kander River flowed. It was considered that the material filling the gorge must have consolidated, in the course of hundreds of thousands of years, virtually to rock hardness and that there would be no risk in tunnelling through it. But when the advanced heading was about midway across the gorge it suddenly collapsed, and an influx of sand, boulders and water, under extreme pressure, blew in the whole front end of the heading. It was found necessary, before the tunnel could be safely completed, to deviate considerably from the intended line, so as to traverse nothing but the solid rock. The tunnel was completed in September 1911. THE FIRST LOCOMOTIVE to pass through the St. Gotthard Tunnel made its journey on December 23, 1881, and the line was provisionally opened on January 1, 1882. 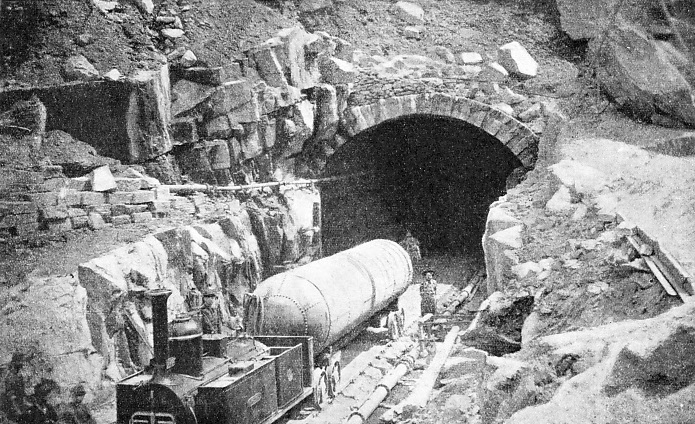 Several years later, in 1889, the tunnel was enlarged to its full size.